Huskies bike to campus from all over Seattle and beyond. On this page we have collected some of the most popular major routes from nearby neighborhoods, links to local cycling clubs and information about classes. The ASUW Bike Shop offers a variety of bicycle maintenance and repair classes. The Cascade Bicycle Club and REI also offer bike classes. The ASUW Bike Shop offers a range of bike repair services. For on-the-go quick fixes, take advantage of our do-it-yourself bike repair stations located around campus. Each station has an air pump and other tools such as tire irons and screwdrivers. These stations are located near Gates Law School, HUB, IMA, UW Medical Center (off Pacific St.), inside the UW Tower parking garage, Spokane Lane (behind Kane Hall) and Okanogan Lane (west of Bagley). View large version of UW bike repair stations map. If you are interested in riding with a group on campus, check out The Husky Cycling Club. Not sure where to start? We’ve grouped some popular routes below by zip code and neighborhood, and listed some other bike map sites you might helpful. Want a customized route prepared just for you? Reach out to our Commute Options team. Please note: The following route information is for planning purposes only. There are inherent risks in all forms of travel and you should always follow your judgment when it comes to safety. You are solely responsible for obeying all rules, signs and laws as well as all risks associated with your commute choice. View a large version of the route map. Left on NE Ravenna Blvd (bike lane). Signal and merge early into the left turn lane and make eye contact with drivers before you proceed through this 5-way intersection. 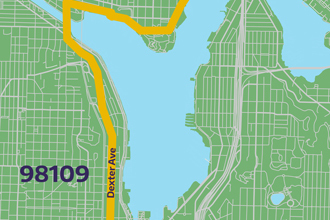 This route is fairly flat and is mostly made up of bike lanes or one-way roads. Bus traffic is low and there are fewer stops. 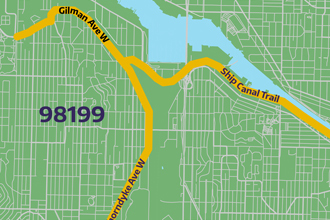 A popular alternative to 77th is to take Greenlake Drive N up to 83rd, where there is another traffic light crossing Aurora Ave N. 83rd is a good low-traffic route to north Ballard/Crown Hill. 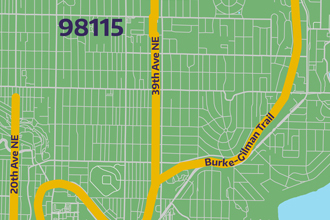 In Wallingford, the Neighborhood Greenway on 43rd /44th is a popular alternative to 45th, and can take you to Thackery (southbound) or Latona (northbound) for access to the Burke-Gilman Trail. 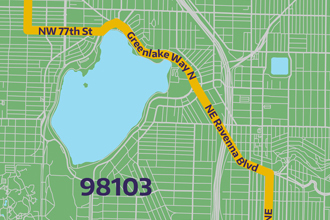 Those living north of 45th may find that taking Green Lake Way N or neighborhood streets to Ravenna may work better than heading down to the trail. Fremont Ave is a popular route for those living in Fremont and Phinney, and provides a nice exercise opportunity in the uphill direction at the end of the day. Turn right on 8th Ave (bike lane) – be aware of parked cars next to the bike lane, and ride further left to avoid the door swing zone. 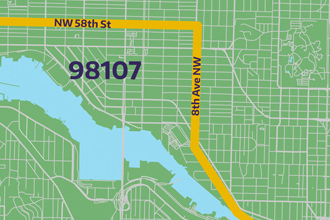 Continue on the trail onto campus, then follow U-District streets to your destination. This route is straightforward with very low elevation change. 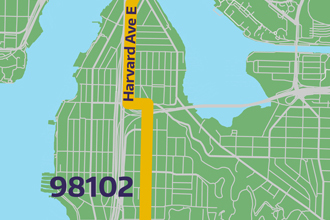 Other popular routes in this zip code use Lakeview Blvd E and Boylston Ave E to reach Harvard and Eastlake. 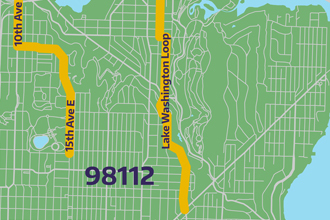 Depending on how far south you start, take residential streets to access Martin Luther King Junior Way, 28th Ave E, or 26th Ave E.
Follow signs for “Lake Washington Loop,” which will take you through a succession of neighborhood streets: from 26th over to 25th to 24th.  After passing Hec Edmundson Pavilion, use the ramp to ride up to the Hec Ed bike and pedestrian bridge over Montlake Blvd – be slow and cautious around the ramp up to the bridge, especially when you are going in the opposite direction heading home.